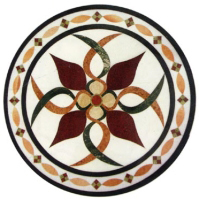 Marble Inlay Floorings, Wholesale Suppliers, Manufacturers Exporters of Marble Handicrafts with Inlay Work, Floorings from India. 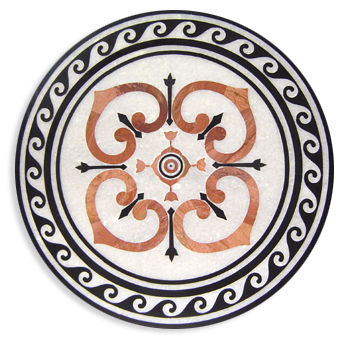 Marble Inlay Floorings, Wholesale Suppliers, Manufacturers & Exporters of Marble Handicrafts with Inlay Work, Floorings from India. 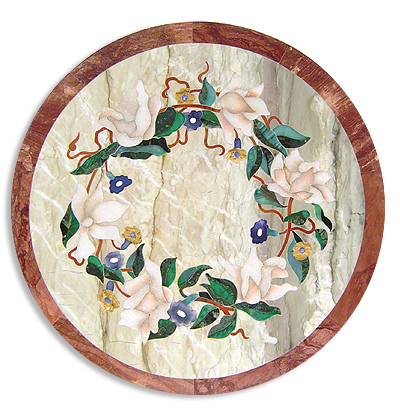 Welcome to Monarch Crafts, manufacturer & exporter of marble inlay handicrafts. 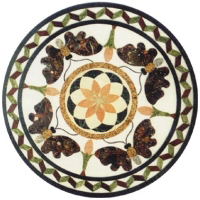 We are keeping alive the art of inlay work (Pietra Dura) which adorns TAJ MAHAL and other Mughal's monuments. We have masters of this art. It will add beauty and elegance to your interior decor. Stunning collection of Inlaid Floorings from India. Looking for flooring solution for your projects? Add an exclusive appearance to your decor with our remarkable floral and geometrical designed tiles colorfully inlaid on White Marble & Black Kudappa Stone. We have our own manufacturing unit and proud to have masters of inlay art. It makes us to offer customized designs so that we can produce tiles according to the project's requirement. Description: Look no further for mind-blowing options in marble floorings! Stones have been inlaid to create artistic patterns that accentuate the decorative feel, that this flooring seeks to bring about. Description: Stones inlaid to create artistic patterns that accentuate the decorative feel, that this flooring seeks to bring about.